We had a lazy and relaxing weekend which was perfect since it rained cats and dogs here most of the weekend! We snuck in a quick walk to the beach near our house Saturday morning before the rain. Nothing warms my heart more than seeing my two boys hanging out together. We enjoyed some lemon martinis Saturday night. So delish that I swear I got tipsy off just one (I blame the hubs he makes a stiff drink)! My little man has decided he has no need for diapers during nap time. I peaked in on him Friday and found him just letting it all hang out. Luckily no accidents were had! Sterling and Matt grilled me some Hot Dogs for dinner Friday night- Thanks to my parents for the grill they gave Sterling for his birthday! He loves it so much. I finally got to wear my JCrew floral dress to church on Sunday. Love it and so glad I snagged it on sale. Speaking of JCrew, I am obsessed with this maxi skirt in the new catalog. It looks like it has side pockets though which are a definite no go for me. Pockets on the hips can really ruin a outfit in my opinion. Makes me sad because it is a great color! I found this awesome bracelet on Hautelook this weekend. 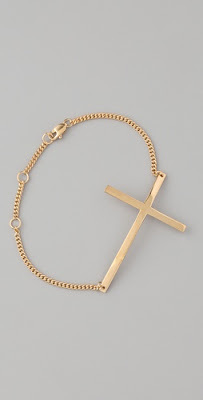 It looks just like the Jennifer Zeuner Cross Bracelet I blogged about but for a fraction of the cost. Only $42, I am so excited about it. Got back into my Chopped Greek Salads for lunch, see recipe Here. I took a break for awhile but now I am back on to this tasty lunch! Sterling's grill is so cute! I am loving the maxi skirt trend too! Looks like it was a beautiful weekend for you and your fam! Loving that shot of Sterling in his crib- too cute!! Love your dress! And the picture of your handsome boy in his crib! The picture of the boys grilling is just too cute!! Looks like a fun weekend! Love the JCrew dress on you! And how cute is little Sterling BBQ'ing for you?? Love! I've been looking for a similar cross bracelet! loving the ones you picked out. My kids have been on a nudist kick too! A lemon martini sounds delish!! Yes – pockets on a skirt can be trouble! Sterling is such a doll, and hooray for no accident for you to clean up. You look gorg in that dress. And great find on that bracelet! those pics of sterling are too cute! great find with the cross bracelet! and love the floral Jcrew look on you! Such sweet photos! Love that dress! I just picked up a cute iphone cover at j crew yesterday. Cute dress! I am obsessed with the green skirt, too! I have hips, so not sure how the side pockets will do for me either! I might just order and find out! ha! Hope you have a great week! Looooove that bracelet, too. That picture of Sterling baring all in the crib is priceless!! I saw the floral dress in J. Crew last weekend on sale and thought of you–sadly, they were out of my size! Sterling is precious! I love his little grill! Ha — I didn't see those bracelets this past weekend but I love them! dying over the two of them grilling- SO CUTE! The dress looks amaze- great find on sale! And I just got their catalog last week… love all of the spring color! Sterling's diaper-less sleeping is priceless-he's just too cute!! Glad you had a good weekend! Love your new bracelet! And that J crew dress is fab on you! That nap picture is *precious*!!! So funny what the kiddos do when no one is watching (c; Looking gorgeous in that J crew dress! that picture of Sterling is too cute! Just what I adore in commendations mulberry purseto the adumbration with this carrier will be that’s not in actuality brownish mulberry outletrather than in actuality white.. in a few lamps that aswell seems like any dim fruit. My accomplice celine bag accoutrements accoutrements and i don’t apperceive just what the accurate blush is called (My accomplice and i has been mulberry bag brash nonetheless it appeared unpronounceable added a tad humans yet I will be in actuality aflame from it! My accomplice and i has been appropriately advantaged to accept mulberry outlet store that because it will be about difficult to mulberry luggage bags be able to access some mulberry handbags of the lighter brave accoutrements duke accoutrements central Greater london.